Our main church is in Wallasey, in the Cemetery in Rake Lane. CH54 5DE will get you to the main gate and the church is at the top of the drive. Please feel free to come along. Please note, we do not use the little church in Father Paul's house on a Sunday. It is quite likely that you will be welcomed if you look unfamiliar with the church.There are three or four service books on the pew at the side of the book stall. The black ones are a little easier to follow than the blue ones but it is probably best to just take in the atmosphere of the service to start with rather than try to follow the text in a prayer book. The parishioners of St Elisabeth's are very friendly and will chat to you after the service over a cup of tea or coffee. Refrain from chatter. You have come to a holy place. Please do not indulge in converstation before or during the service if you can avoid it. This could upset or disturb the atmosphere of prayer within the church. It is helpful if you can set your mobile phone onto silent or switch it off completely. We stand for worship. 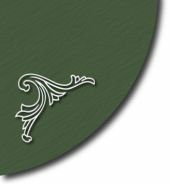 There are some seats around the walls of the church for those who need them but, generally speaking, we follow the traditional posture of Christian worship, standing ready to take part in the physical gestures of worship. At the same time, our services are not intended as a test of physical endurance. Wear comfortable shoes and sit down if you need to. Please do, however, stand for the chanting of the Gospel. We sit for the sermon. We normally pray towards the East. 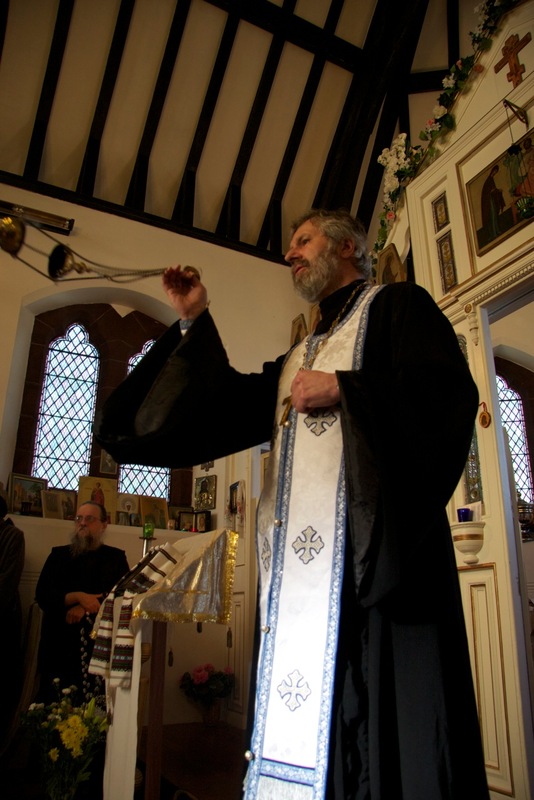 Orthodox Christians face East to pray, whether they are at home or in church. Churches are traditionally built so that priest and people together face east, and our church is no exception. We normally light a candle. Most Orthodox Christians light a candle when they come into church. This symbolises Christ as the Light of the World and our offering of prayer to Him. You may wish to light a candle yourself. You will find them on the table near the door when you come in. There is no collection but donations for candles are welcome. The little loaves and the lists for prayers Most Russian Orthodox Christians write a list of names of their living and departed loved ones and place them on a plate with a little loaf (prosphora) ready for the priest to remember them during the preparation of the gifts (bread and wine). Most Orthodox Christians leave a donation for the prosphora. Most of the service is chanted . We have a small choir that leads the congregational singing. Please feel free to join in as much as you would like. We sing the Lord's Prayer in English and in Slavonic. You should try to join in. Our worship involves our body, mind and spirit. Vestments, incense, candles, singing, ceremonial movement, bowing, crossing ourselves and kissing icons, Often these various things happen simultaneously. Orthodox worship can be passive or active. Prepare yourself for some physical involvement. Head coverings and clothing. Generally speaking, lay men remove their head coverings in church while women cover their heads for worship. Headscarves (available in the porch), veils, or hats are all customary for this purpose. Traditional Orthodox women do not normally wear trousers to church. Not every national Orthodox Church follows this custom. Please do not worry too much if you feel more comfortable coming as you are. We only ask that you dress modestly. Holy Communion. Communion is a sign of fullness in the participation of the Life of Christ and His Church. Only Orthodox Christians may receive Holy Communion at the Holy Liturgy, and only then after preparing themselves through prayer, fasting, (at least from midnight the night before) and confession. If you are Orthodox and intend to receive Holy Communion, please make yourself known to the Father Paul before the Liturgy begins if possible. Monastics and minor clergy receive Holy Communion first often followed by babies or children. All visitors - Orthodox or not - are invited to kiss the Cross and receive the blessed bread at the end of the Liturgy. Please do stay to speak with us once the service has finished. If it is a Sunday, we usually have refreshments after the Liturgy, and once a month we have a bring-and-share lunch together. Sometimes, Father Paul gives a talk during lunch. Times of our services may be found here and directions are here. 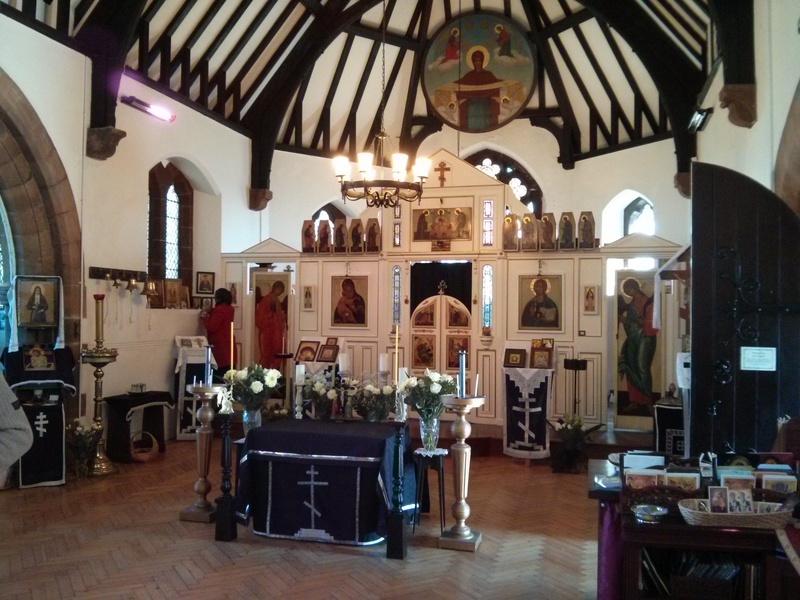 Perhaps the most helpful summary of what to expect on a first visit to an Orthodox church is provided by Khouria (Matushka) Frederica Mathewes-Green: 12 Things I wish I'd Known... Please note that this summary is designed for American readers. The church was originally built as a cemetery chapel and became an orthodox Church in 2009. It was built in 1883 but was in very bad condition until it was given to the Russian Orthodox Church Outside of Russia (ROCOR), Elsewhere on the website there is a little more about its history. It does not look like a traditional Orthodox church from the outside. Once you get inside, you will see that St Elisabeth's is laid out as a traditional Orthodox church. Please respect our traditions and customs. If there is anything about which you are still uncertain, please feel free to ask Father Paul or one of the parishioners, and we will be more than happy to answer your questions if we can and put you at ease. We hope you enjoy your visit to St Elisabeth's.